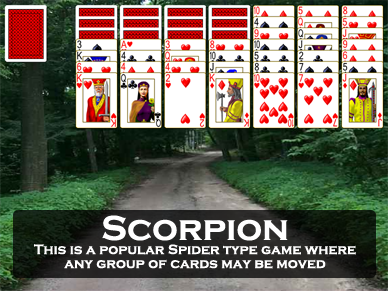 Screen shot of the game Triple Scorpion from Pretty Good Solitaire. 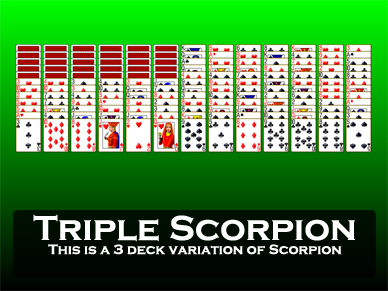 Triple Scorpion is a three deck Spider type game, part of the Scorpion subtype of Spider type games. 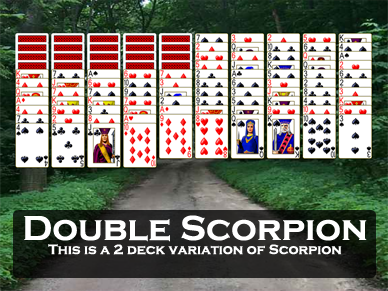 It is a three deck version of the single deck game Scorpion. At the start of the game, 12 cards are dealt to 13 tableau piles. In the first six piles, the first five cards dealt are dealt face down. 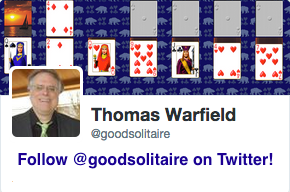 All other cards are dealt face up. Building in the tableau is down by suit. Groups of cards are moved like in the game Yukon and Scorpion - you can move groups of cards in the tableau regardless of any sequence. Any face up card, no matter how deeply buried, can be moved by picking it and all the cards on top of it up together. Empty spaces in the tableau can be filled only by a King, or a group of cards headed by a King. There are no foundation piles. Instead of moving cards up to foundations, all building takes place in the tableau. The objective is to arrange all the cards into 12 piles of 13 cards each, in sequence from King down to Ace in suit. This is much like the game Spider, except that the completed sequences are not removed from play. It works exactly like Scorpion. It is very important to uncover the face down cards, because only the face up cards are in play. Once a card is face up, it can be accessed, so getting the cards face up is the key. 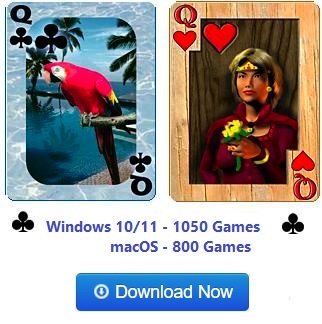 The game plays exactly like Scorpion or Double Scorpion, except that there are more cards. Triple Scorpion is won on average 20% of the time, but very high percentages seem possible.